On Monday morning, President Trump ordered the United States Trade Representatives to find $200 billion worth of Chinese goods to tariff. China responded by putting a tariff on $50 billion worth of U.S. goods. Trump has since threatened to enact yet another tariff on the country. Such escalation is sparking fear of a “trade war”. A trade war spells trouble for Apple, a company headquartered in California and who manufactures mostly in China. The United State’s biggest import from China is smartphones, totaling $70.4 billion in 2017. JP Morgan has stated that “A substantial portion of China’s exports are western products manufactured locally — [such as] Apple (AAPL) iPhones.” Almost 20% of Apple’s revenue comes from China, as the company shipped over 41 million phones there. Although Apple has received reassurance from President Trump that they would not be on the list of items subjected for the tariff, the tech company still may be affected. Will Tariffs Take a Bite out of Apple? Apple has been increasing its inventory by 3.3 billion in preparation for possible repercussions. The company has many rightful worries on when and how they may be affected. Tariffs may affect Apple’s suppliers, causing major delays or a rise in costs. Fear also spawns over the possibility of a repeat of 2016: Apple services being banned by China. In doing so, China could make a huge push for citizens to use Chinese smartphones over American ones. Also, if China were to tax iPhones, prices would rise and Apple would be driven out of the market. Apple’s stock has slumped since the announcement of the additional tariffs. This partnership is a huge win for Apple because Oprah brings to the table her dedicated fan base. This phenomenon goes by the name of the “Oprah Effect”. The Oprah Effect is when any product associated or endorsed by Oprah Winfrey see a huge boost in sales. For instance, after Oprah Winfrey bought 10% of Weight Watcher stock, more than 600,000 members joined the program. Apple looks to carry over this trend to their new service with hopes that Oprah’s huge audience will start watching the new streaming service. Oprah’s partnership is a drop in the bucket compared to Apple’s approximately one billion dollar investment into its streaming service. With decreasing iPhone sales, Apple hopes that this streaming service will be a home run for them. However, it is going to be competing against companies putting in more than triple the amount of investment into their streaming services, such as Netflix who just acquired former President Obama. Following the announcement, Apple’s stock gained. Apple’s core goal is to create excellent the best product possible while respecting the privacy of those who use their software. Privacy is a huge concern for Apple in a time in where it seems that our lives are public for all to see. Thus, Apple is taking a huge step forward to try and protect it’s valued customers from immoral data apps and law enforcement. On June 12th, Apple updated its App Store policy to restrict all apps from harvesting the data of other apps and contacts that iPhone users have. This is direct attack on Facebook who collects data for marketing and acquisition opportunities through their VPN app, Onavo. This App Store update comes after Facebook was involved in the Cambridge Analytica scandal, where millions of users data was taken from Facebook unbeknownst to them. Last year, Apple took a lot of flack for not giving the FBI access to a terror suspect’s iPhone data. The news was so big that the President of the United States switched to an Android over Apple’s refusal. However, the FBI went to a third party and got the phone unlocked through them, a data breach that Apple found worrisome. The company will now go forward with a brand new update which gives iOS devices that are prone to the hack a new software called “USB Restriction Mode”. This mode stops hackers by restricting data from being transferable after an iOS device has been locked for an hour. Law enforcement are astonished by this update and ridicules Apple for it. They feel as if American citizen’s safety is in danger if they cannot access suspects personal data. To Apple, this isn’t just a law enforcement problem, but a problem for any criminal willing to bypass the iOS encryption. So, they are satisfied with this update as privacy is fundamental to them. Apple’s stock price has decreased from June 12th to June 13th by .82% and volume increased by 26.83%. For the latest Apple Stock News, AAPL closed at $145.83 on, June 28th, 2017. It had a gain of 1.45% from its previous close on June 27, 2017, at $143.74 per share. This Saturday, Apple will open a new store in Taipei marking the company’s debut in the country. The store will be home of the new “Today at Apple” program, designed for costumer to develop their creative and artistic side. Taipei 101 will offer more than 60 hands-on sessions on various topics such as photography and video, art and design, music, coding and more. Structure-wise, there will be a video wall at the center of the place, contributing to a very dynamic atmosphere. Interactive displays will instead cover the store’s walls and will be dedicated to music, photography, apps and more. Finally, in Taipei 101. there will be a space totally destined to entrepreneurs:”The Boardroom”. There, they will hold regular training sessions. To celebrate the opening, artist Yang Shih-yi will showcase a big and elaborate tree cutout designed to welcome people into the store and emphasize the tree as the place theme. The same design currently decorates the boarding, protecting the store from sight as construction terminates. 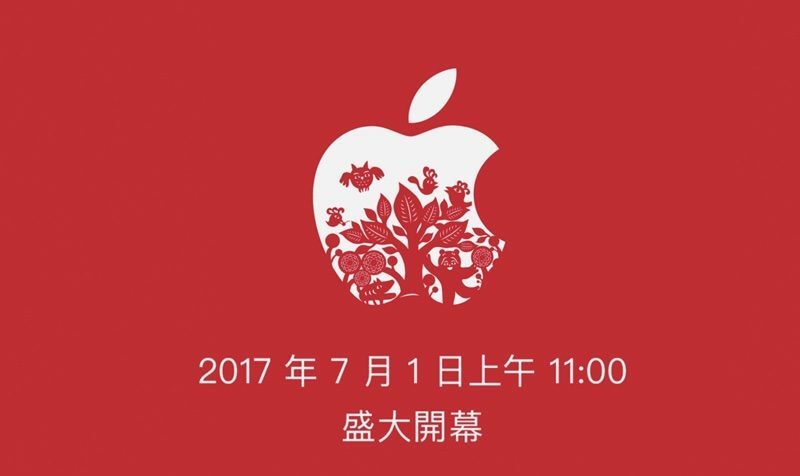 According to Apple’s Taiwanese website, the store will open on Saturday, July 1. For the latest Apple Stock News, AAPL closed at $145.82 on Monday, June 26th, 2017. It had a loss of 0.33% from its previous close on June 23, 2017, at $146.31 per share. This past week, information on Apple’s latest prototype leaked from MobileFun. The website posted the first protective cases for the iPhone8. As it had done already with its precursor, the iPhone7 and with the Galaxy S8, this revealed Apple’s main new features. Apparently the new iPhone will include a larger than before display of 5.8 inches, a vertically aligned dual camera and no home button, which will be likely integrated as a touch element. A “cut-out” at the top of the display will include the front camera and sensors. These latest changes have the potential to radically transform the iOS 11 with a new “Function Area”. That could renovate the way users receive and interact with notifications. Despite positive sales predictions whether these changes will turn into a success or not will depend on consumers’ willingness to pay the high listing price of at least $1,000. However, given Apple’s brand recognition and higher customer loyalty, Apple expects to repeat its success. Competitors may be offering more affordable options but consumer’s still seem willing to pay a premium for Apple products. For the latest Apple Stock News, AAPL closed at $150.25 on Wednesday, May 17th, 2017. It had a loss of 3.36% from its previous close of $155.47 per share. Apple has begun releasing its shipments of iPhone SE manufactured in Bengaluru, India. Bengaluru is the leading exporter of information technology in the country. Hence, some refer to it as the “Silicon Valley” of India. As an emerging market with the second largest population, Apple sees potential. Furthermore, such a market could expose Apple to higher growth in phone sales. Apple aims to become the leading market share holder of smartphones sold in India. Apple may have a lower import tax given the phone’s manufacturing location and its proximity to the Indian market. Currently, Samsung has a 28.1% stake in the market. The iPhone SE is a compact version of the iPhone. The phone contain features of the iPhone at a much affordable price. Given the competition of smartphones in India is intense, this phone is viewed as a potential popular sell for this market.